Bryan’s Blu-ray Review of ‘Chariots of Fire’!!! 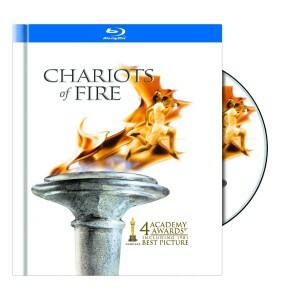 Finally, Warner Bros. gave us the ultimate (so far) edition of ‘Chariots of Fire’ release it deserved. This film is amazing from start to finish. It won best picture at the Oscars in 1981 among others. Even if you haven’t seen the film, I’m sure you have seen the opening title sequence with the runners sprinting along the beach to that iconic score by Vangelis. After watching this again, I can’t seem to get that amazing score out of my head. I keep whistling it. This bluray release is top notch all the way through. Great extras, amazing audio/video, and terrific film to round it all out. Highly recommended. ‘Chariots of Fire’ follows two competitive runners as they make their way to the 1924 Olympic games. There is Harold Abrams (Ben Cross) who is a Jewish man and is the first student to finish the infamous Trinity Great Court Run at Cambridge University. The run consists of lapping the giant courtyard in the time it takes the bell tower to strike 12. However, Abrahams is ridiculed and abused for being Jewish. Then there is Eric Liddell (Ian Charleson) who is on par with Abrahams running ability. Immediately, it’s obvious these two guys rival one another in running. Liddell constantly tries to convince his extremist religious family that competing in running for the Olympic games is pure and virtuous. While Abrahams has hired a professional trainer and is trying to keep his romantic relationship on the up and up, Liddell is having problems persuading his sister that his love for his religion is not soured by running. Despite their trials and tribulations from their peers, family, and strangers, the two make it to the Olympics. Even though this film came out in 1981 and takes place in the 20s, it feels timeless. Director Hugh Hudson just knocked this whole production out of the park. It’s a beautiful portrayal of overcoming hate, faith, and sacrifice. The race sequences will literally take your breath away. A truly remarkable film. 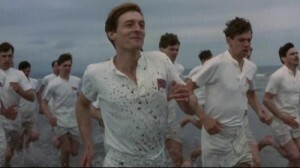 ‘Chariots of Fire’ comes in glorious 1080p high definition and is presented in 1.85:1 aspect ratio. It was remastered for this bluray release and look phenomenal. Warner did one hell of a job cleaning up this 30 year old film and it shows. It’s super crisp and very colorful despite a dull British backdrop. The detail is very good as you can see almost every wrinkle, crease, and crack in wood paneling. The blacks are deep and inky and the colors are vibrant and shine throughout, especially the greens and reds. I noticed a couple of flaws in the form of halos and edge enhancement in the first sequence of the film, but after that, it completely disappeared. Amazing video transfer. The audio has a superb lossless DTS-HD 5.1 audio mix and sounds amazing. That opening scene with that perfect score sounds so incredible on the speaker system, I thought I was in the theater again. The dialogue was crisp and clear without any cracks or feedback. Most of the film takes place on the front speakers, but the ambient noise trickles through the rear speakers and when the score feeds in, all the speakers boast full sound. Great audio presentation. Wings on their Heels: The Making of Chariots of Fire (SD, 27 Mins.) – A behind the scenes little documentary that talks about most aspects of the film with tons of interviews with the cast and crew. Good little featurette. Chariots of Fire: A Reunion (SD, 19 Mins.) – Hudson, Cross, Charleson and others all reunite to talk about the film today and what it was like during production. Everyone is in a roundtable discussion forum. Paris, 1924: Birth of the Modern Games (HD, 28 Mins.) – A historic look a the 1924 Olympic Games. This was amazing to watch. David Puttnam, a Cinematic Champion (HD, 26 Mins.) – This little feature pays homage to the producer of the film David Puttnam. It’s a puff piece that praises his career. Hugh Hudson: Journey to Gold (HD, 14 Mins.) 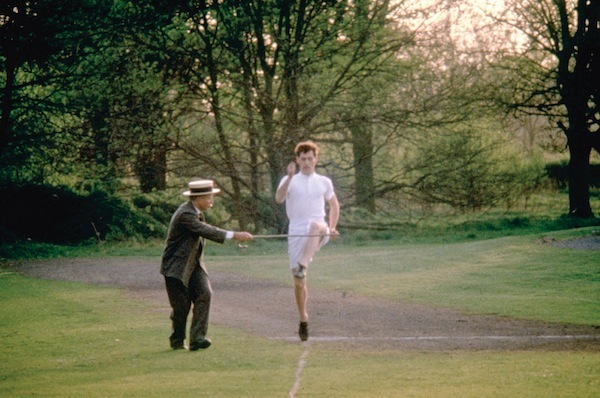 – The director talks about filming ‘Chariots of Fire’ and how it changed his life and creative style. Ben Cross and Patricia Hodge Screen Test (SD, 4 Mins.) – Screen tests with actors Ben Cross and Patricia Hodge. Very cool. Ian Charleson Screen Test (SD, 5 Mins.) – More screen tests. This time for Ian Charleson who died way too early of AIDS. Sprint Around the Quad (SD, 2 Mins.) – This uber short feature talks about that famous Trinity run around the quad at Cambridge University. Famous Opening Shot (SD, 1 Min.) – Here we see that famous opening scene of the guys running on the beach and how it was done. Theatrical Trailer (SD, 2 Mins.) – The original theatrical trailer. ‘Chariots of Fire’ is truly modern classic. It’s iconic, beautiful and remarkable. The acting is superb, and the direction is one-of-a-kind. The video and audio presentations are top notch, and the extras are definitely worth watching. I consider this a must own bluray for anyone and with its 38 booklet and original soundtrack included with the bluray, I give this a very high recommendation. Definitely pick this one up. You’ll be glad you did. This entry was posted on Wednesday, July 11th, 2012 at 11:31 pm	and is filed under Film, News. You can follow any responses to this entry through the RSS 2.0 feed. You can skip to the end and leave a response. Pinging is currently not allowed. « Bryan’s DVD Review of ‘The Amazing Chan and The Chan Clan!! !